The organizations and institutions that, in a traditional civilization and society, would have allowed an individual to realize himself completely, to defend the principal values he recognizes as his own, and to structure his life in a clear and unambiguous way, no longer exist in the contemporary world. Everything that has come to predominate in the modern world is the direct antithesis of the world of Tradition, in which a society is ruled by principles that transcend the merely human and transitory. Ride the Tiger presents an implacable criticism of the idols, structures, theories, and illusions of our dissolute age examined in the light of the inner teachings of indestructible Tradition. Evola identifies the type of human capable of “riding the tiger,” who may transform destructive processes into inner liberation. He offers hope for those who wish to reembrace Traditionalism. This book sets out to study some of the ways in which the present age appears essentially as an age of dissolution. At the same time, it addresses the question of what kind of conduct and what form of existence are appropriate under the circumstances for a particular human type. This restriction must be kept in mind. What I am about to say does not concern the ordinary man of our day. On the contrary, I have in mind the man who finds himself involved in today’s world, even at its most problematic and paroxysmal points; yet he does not belong inwardly to such a world, nor will he give in to it. He feels himself, in essence, as belonging to a different race from that of the overwhelming majority of our contemporaries. The natural place for such a man, the land in which he would not be a stranger, is the world of Tradition. . . .
Everything that has come to predominate in the modern world is the exact antithesis of any traditional type of civilization. Moreover, the circumstances make it increasingly unlikely that anyone, starting from the values of Tradition (even assuming that one could still identify and adopt them), could take actions or reactions of a certain efficacy that would provoke any real change in the current state of affairs. After the last worldwide upheavals, there seems to be no starting point either for nations or for the vast majority of individuals--nothing in the institutions and general state of society, nor in the predominant ideas, interests, and energies of this epoch. Nevertheless, a few men exist who are, so to speak, still on their feet among the ruins and the dissolution, and who belong, more or less consciously, to that other world. A little group seems willing to fight on, even in lost positions. . . But this does not resolve the practical, personal problem--apart from the case of the man who is blessed with the opportunity for material isolation--of those who cannot or will not burn their bridges with current life, and who must therefore decide how to conduct their existence, even on the level of the most elementary reactions and human relations. This is precisely the type of man that the present book has in mind. To him applies the saying of a great precursor: “The desert encroaches. Woe to him whose desert is within!” He can in truth find no further support from without. There no longer exist the organizations and institutions that, in a traditional civilization and society, would have allowed him to realize himself wholly, to order his own existence in a clear and unambiguous way, and to defend and apply creatively in his own environment the principal values that he recognizes within himself. . . There is an important point to clarify at the outset regarding the attitude to be taken toward “survivals.” Even now, especially in Western Europe, there are habits, institutions, and customs from the world of yesterday (that is, from the bourgeois world) that have a certain persistence. . . . This is not what I call the world of Tradition. Socially, politically, and culturally, what is crashing down is the system that took shape after the revolution of the Third Estate and the first industrial revolution, even though there were often mixed up in it some remnants of a more ancient order, drained of their original vitality. What kind of relationship can the human type whom I intend to treat here have with such a world? The answer to this question can only be negative. The human type I have in mind has nothing to do with the bourgeois world. He must consider everything bourgeois as being recent and antitraditional, born from processes that in themselves are negative and subversive. . . .It is good to sever every link with all that which is destined sooner or later to collapse. The problem will then be to maintain one’s essential direction without leaning on any given or transmitted form, including forms that are authentically traditional but belong to past history. . . . As we shall soon see, the support that Tradition can continue to give does not refer to positive structures, regular and recognized by some civilization already formed by it, but rather to that doctrine that contains its principles only in their superior, preformal state, anterior to the particular historical formulations: a state that in the past had no pertinence to the masses, but had the character of an esoteric doctrine. . . .The phrase chosen as title of this book, “Ride the Tiger,” may serve as a transition between what has been said hitherto, and this other order of ideas. The phrase is a Far Eastern saying, expressing the idea that if one succeeds in riding a tiger, not only does one avoid having it leap on one, but if one can keep one’s seat and not fall off, one may eventually get the better of it. . . This symbolism is applicable at various levels. First, it can refer to a line of conduct in the interior, personal life; then to the appropriate attitude in the face of critical, historical, and collective situations. . . . In the classical world, it was presented in terms of humanity’s progressive descent from the Golden Age to what Hesiod called the Iron Age. In the corresponding Hindu teaching, the final age is called the Kali Yuga (Dark Age). Its essential quality is emphatically said to be a climate of dissolution, in which all the forces--individual and collective, material, psychic, and spiritual--that were previously held in check by a higher law and by influences of a superior order pass into a state of freedom and chaos. "One of the most difficult and ambiguous figures in modern esotericism." "Evola looks beyond man-made systems to the eternal principles in creation and human society. The truth, as he sees it, is so totally at odds with the present way of thinking that is shocks the modern mind." "It is one of Evola's greatest merits that he combines a prodigious wealth of erudite detail with the gift of isolating from their local conditioning ideas or disciplines that are of value to us." "Evola rises above the usual dichotomies of left and right, liberal and conservative, challenging us to reconnect our lives and our institutions to the timeless spiritual standard that guided our ancestors." 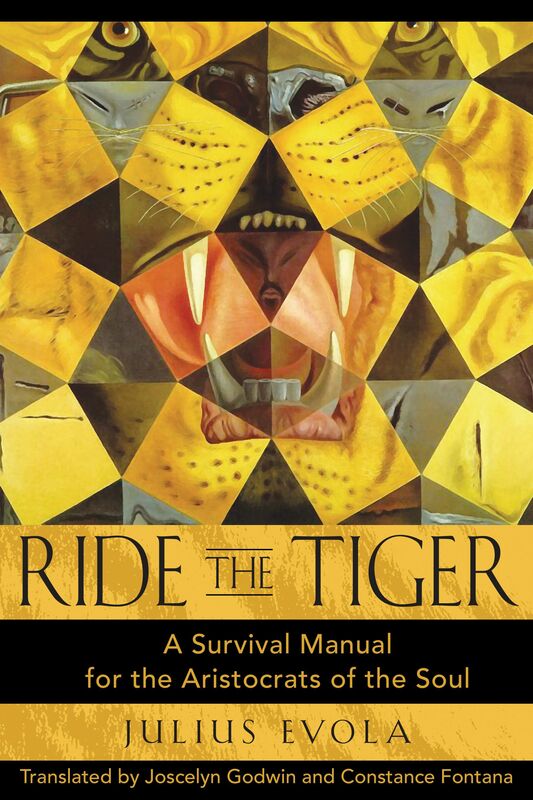 "Ride the Tiger offers a practical view of how to be truly awakened in a dark age." ". . . this is an important work for an intellectual history of the twentieth century. . ."
"Simply put, Evola shows, unintentionally but with passion, why European Tradition may not be able to match East Asia in riding the tiger in today's world. It lacks a spirituality for today's mundane world, tempered by the harsh realism of Daoism and the practical disciplines of Confucianism."